A backed up sewer line is one of those problems that no homeowner ever wants to deal face, but problems like these are, unfortunately, pretty common. A clogged sewer line can easily cause thousands of dollars in damage and cost a small fortune to repair, and since your sewer is responsible for safely removing hazardous waste from your home, it’s a problem that needs to be remedied immediately. 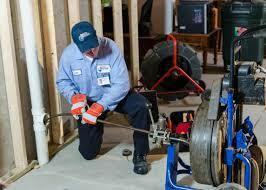 When you’re in need of sewer cleaning in Webster NY, depend on the experts right here at G.T. Campbell. We can fix any clogged sewer in no time. Foreign objects, grease and tree roots all can cause major clogs that prevent raw sewage from flowing away from your home as it should. In cases of severe blockages, nasty waste can even start backing up into your home’s crawl space or basement. When this happens, it’s an emergency situation that requires immediate attention. Backed up sewage is a serious health hazard, and you should never try to clean it up yourself. At G.T. Campbell, we can safely handle any problem relating to a clogged sewer. When you contact a plumber in Webster NY for sewer cleaning in Webster NY, we’ll send a certified technician out right away to assess to the situation and get to work. We clean sewer lines quickly and safely, and we can take care of even the most stubborn sewer clogs without damaging your pipes. Everyone hopes that they’ll never have to deal with a clogged sewer, but many of us will experience this frustrating situation at some point. When you need sewer cleaning in Webster, trust the experts right here at G.T. Campbell. Whether your water is draining slowly or you have a complete blockage with waste backing up into your home, no clog is too big or too small. Call G.T. Campbell today for professional sewer cleaning services you can count on!